It is not uncommon to hear people say about Paul Gauguin, as they do about Edvard Munch, that his prints are more important than his paintings. 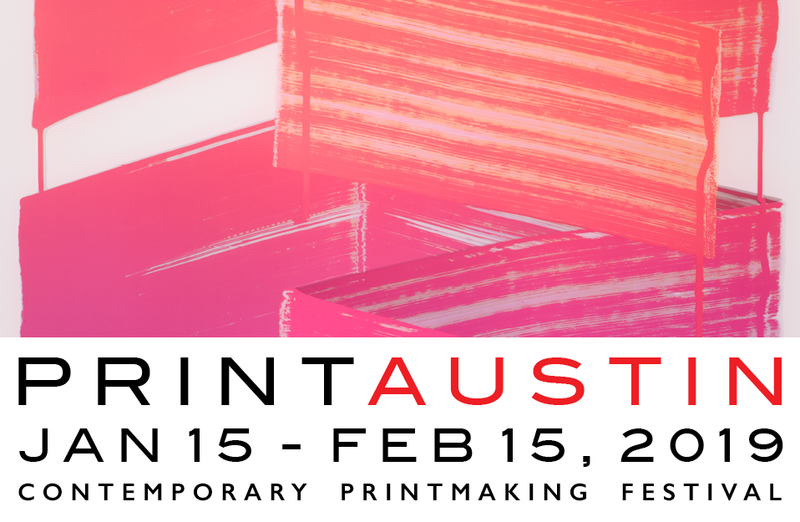 This argument is usually predicated on the prints’ visual adventurousness and unfettered experimentalism, qualities frequently subsumed under the headings of ‘authenticity’ and ‘originality.’ Certainly many of Gauguin’s woodcuts and monoprints constitute a more radical departure from Western pictorial norms than do his paintings, but a new examination of Gauguin’s first, experimental woodcut series argues that the real radicality of Gauguin’s prints lies not in their ‘originality,’ but in the artist’s recognition that originality and authenticity were, in fact, unattainable. Paul Gauguin, Te Nave Nave Fenua (Delightful Land) (1894), woodcut. Printed by the artist. National Gallery of Art, Washington DC. Less familiar is the largely fictional account that he wrote of his adventures, Noa Noa (Fragrant Scent), and the set of ten woodcuts he made to accompany it. Though the book was never published as intended, the woodcuts were presented in a private exhibition in Gauguin’s studio in December 1894. 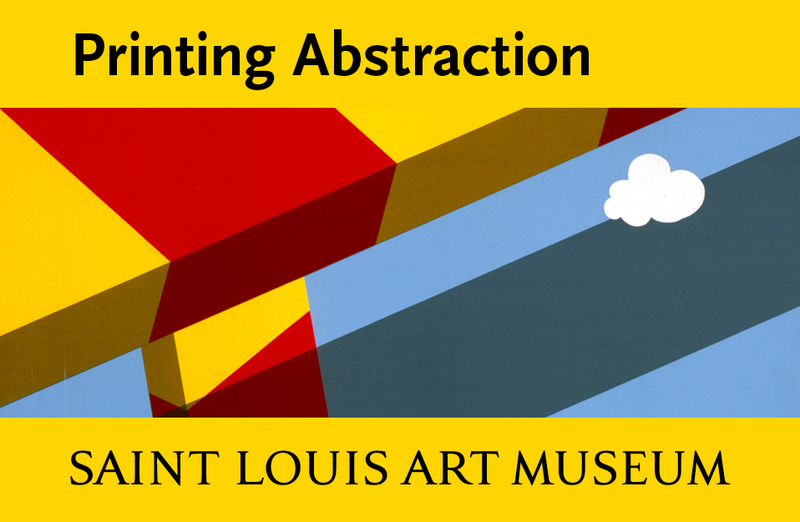 He showed multiple impressions of each, printed by himself in the manner of monotypes: painting color on the block, rubbing the paper to the block with his hand. 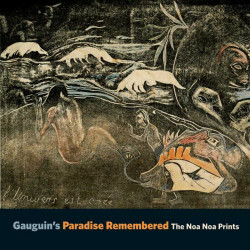 Within Symbolist circles, the Noa Noa prints were instantly recognized as important: “Gauguin’s current effort will tomorrow provoke a complete revolution in the art of engraving,” Charles Morice wrote in Le Soir. In many ways, however, the Noa Noa prints are unprepossessing things, modest in size (about 8 x 14 inches each) and murky in demeanor. 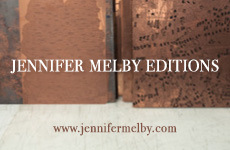 They mark the artist’s first foray into relief printing and only the second time he tried making prints at all. He worked without a press, proper tools, or technical expertise. His blocks were commercially prepared endgrain boxwood, intended for the neat high-contrast of reproductive wood engraving (already an outmoded medium in the 1890s), but Gauguin chose to hack at them with carving tools and scratch their surfaces with needles and sandpaper. 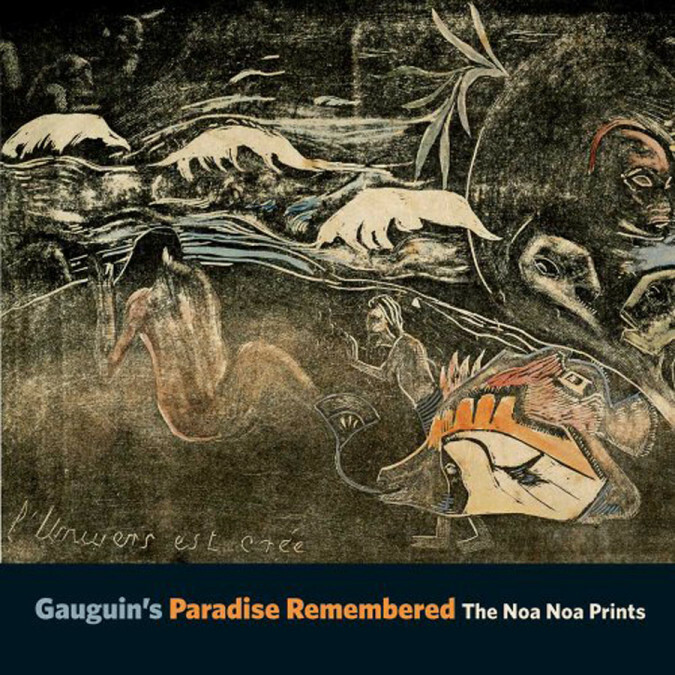 Gauguin’s Paradise Remembered: the Noa Noa Prints started as a case study, sparked by the Princeton University Art Museum’s acquisition of one of the artist’s hand-printed Noa Noa proofs, l’Univers est crée. The catalogue reproduces the 31 objects that appeared in the exhibition, including woodblocks, drawings, and variant impressions of the prints. But the real action here lies in the catalogue essays: Calvin Brown painstakingly examines the physical evidence – the multiform proofs and editions and the carved blocks themselves—while Alastair Wright analyzes Gauguin’s visual and conceptual sources and what their profusion suggests about the artist’s intentions. 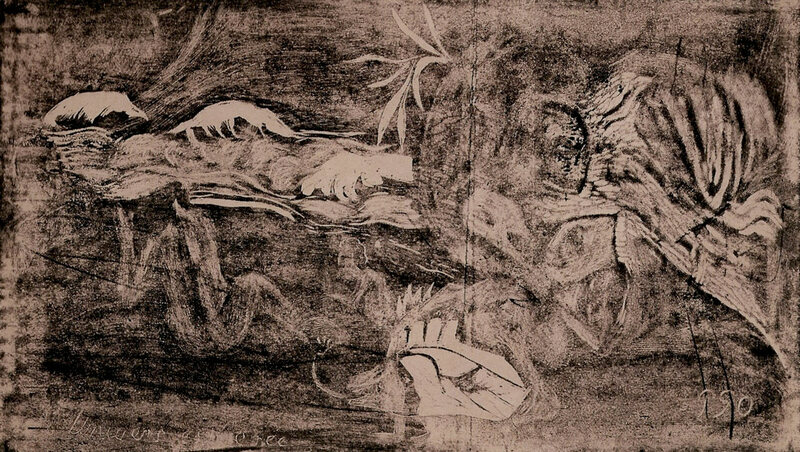 Beginning with what might seem rather unpromising material (l’Univers est crée, they acknowledge, “hovers at the edge of illegibility”), they build a case for the importance of the Noa Noa series not simply as visual invention, but as the key to a new and subtle reading of Gauguin. Noa Noa, they argue, does not simply exploit a medium, it is an exploration of media—of reproduction and representation as markers of loss, absence, and the impossibility of uncompromised experience. 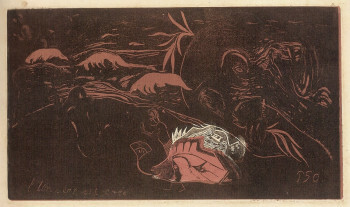 Paul Gauguin, l’Univers est crée (The Universe is Created) (1894), woodcut. Printed by the artist. The Art Institute of Chicago. l’Univers est crée is represented here in seven different forms: the original woodblock; four wildly different proofs printed by Gauguin; an impression from the more professional though less nuanced edition printed by Louis Roy; and one from the final edition that was printed, some thirty years later, by the artist’s son Pola Gauguin with a delicacy and clarity that may or may not align with Gauguin’s own aims. In Pola’s impression, we can see distinctly the male torso and female figure to the left, the waves crashing on the beach, the large fish and small walking figure glued together like an aquatic centaur, the looming cloud of human and animal heads in the upper right. In Gauguin’s own impressions, under-inked and over-painted, these entities recede to various degrees into smoky atmospherics. 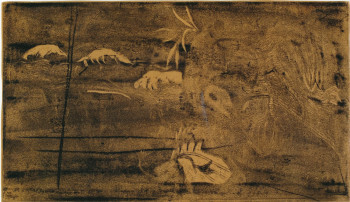 In Princeton’s impression little can be identified beyond the fish, the waves, and a faint shadow of the woman on the beach; in a version from the Art Institute of Chicago even the woman disappears (though in Chicago’s other impression every element is visible, picked out in colors hand-painted on the block). To make sense of Princeton’s impression, one must look at its sister impressions; to make sense of those impressions, it helps to know something about the project as a whole—the other images and the text; to make sense of the project as a whole, it has to be examined in the context of Gauguin’s other work and the myriad sources he cobbled together to concoct his supposed atavistic reality. This last point is brought home in the discussion of Nave Nave Fenua (Delightful Land). The central image had appeared in earlier paintings and drawings by Gauguin—a naked woman standing in a garden being spoken to by a flying lizard. The Edenic overtones of the Tahitian paradise that surrounds her are hard to miss, but Gauguin’s original Eve was neither Levantine nor Polynesian—her figure and posture was borrowed from a photograph of an Indonesian Buddhist relief, which Gauguin had acquired in Paris at the 1889 Exposition Universelle and brought with him to Tahiti. In his 1890 painting Eve exotique he had given the figure his mother’s face (again taken from a photograph), though by the 1892 painting Te nave nave fenua her face had been replaced by that of his 13-year-old Tahitian mistress. In yet another iteration, Gauguin adds a soupçon of Seurat, rendering Eve in colored dots. 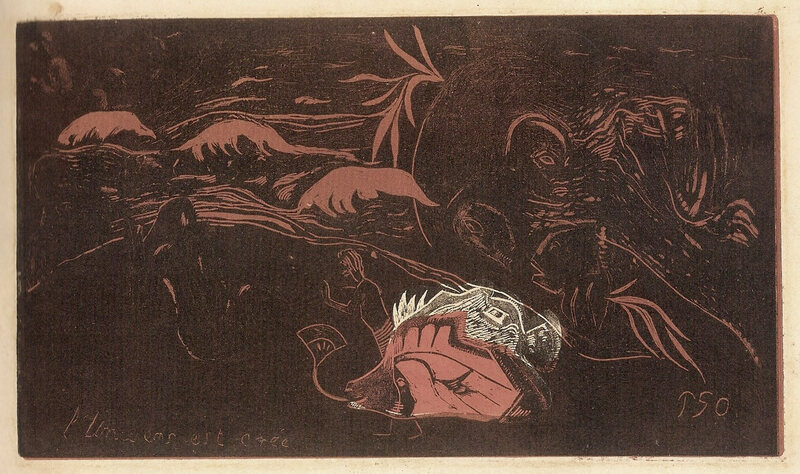 Paul Gauguin, l’Univers est crée (The Universe is Created) (1894), woodcut. Printed by the artist. Princeton University Art Museum. Given Gauguin’s posturing, one can empathize with the exasperation of Camille Pisarro who complained that Gauguin was “always poaching on someone’s land; nowadays, he’s pillaging the savages of Oceania.” It is apparent that paintings supposedly depicting Gauguin’s personal experiences in Tahiti were derived from photographs seen in Paris; that his insights into Tahitian cosmology were lifted from another author; that his notebooks were not repositories of invention, but curated collections of images, words, and ideas, some of which were his, many of which were not. Wright brings these facts to light not to expose Gauguin as a fraud, but to position him as a complex and self-aware artist. 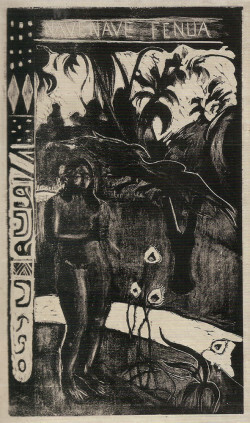 Paul Gauguin, l’Univers est crée (The Universe is Created) (1894), woodcut. Printed by Louis Roy. National Gallery of Art, Washington DC.